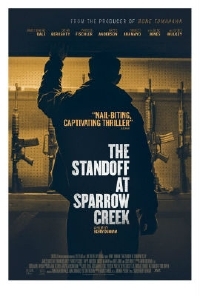 Writer/director Henry Dunham made a splash among critics and film fans alike earlier this year when his feature film debut The Standoff at Sparrow Creek made its debut at the Toronto International Film Festival. The movie stars James Badge Dale as Gannon, a former cop who has joined a militia group. After a mass shooting at the funeral of a cop, Gannon realizes that someone from the group is responsible for the killings. Determined to find out who did it, he quarantines members of the group at an abandoned sawmill and begins a series of interrogations to root out the culprit. The movie also co-stars Brian Geraghty, Patrick Fischler, Chris Mulkey, Happy Anderson and Robert Aramayo. A good thriller is always a welcome sight and if the trailer is any indication, The Standoff at Sparrow Creek is shaping up to be a winner. The trailer builds great tension and from all accounts, it seems the movie delivers on the promise. The Standoff at Sparrow Creek will open theatrically and be available on VOD January 18.